Is your baby’s colon worth having pretty eyelashes? Would you trade your child’s ability to poop for a pretty smelling shampoo? Let’s make a deal: You get convenient spray sunscreen, your newborn gets bowel surgery. Sound like a plan? This is the trade-off pregnant women using conventional beauty products may be making every day because of the ingredient oxybenzone, recently under fire for harming coral reefs and even possibly getting removed from the GRASE (Generally Recognized as Safe and Effective) list by the FDA. For now though, you can still find this toxic endocrine disruptor in mainstream sunscreens as well as “lip balms, shampoos and conditioners, body fragrances, mascaras, hand and dish soaps, and insect repellents, but also single-use plastic packaging and toddler pacifiers and teethers,” according to a press release from Haereticus Environmental Labs just this morning. 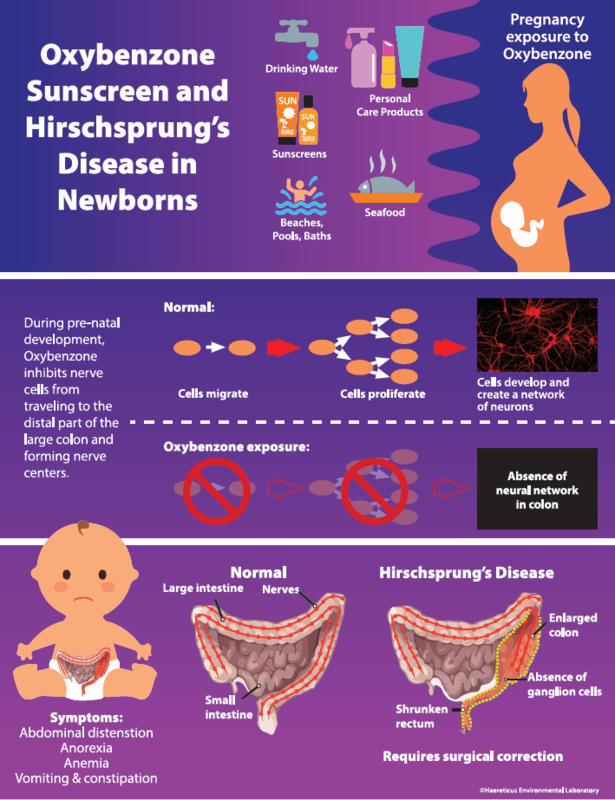 I admit I had never heard of Hirschsprung’s Disease, although I think I know someone who has it and just didn’t know its name. But it’s not actually that rare – 1 in 5,000 babies born in the U.S. are afflicted with this serious birth defect, running pretty similar to Crohn’s Disease, our family’s personal cross to bear, as far as rate of diagnosis. To put this in perspective, are you afraid of your child getting cancer? Dude. I am. Terrified. The American Cancer Society estimated that about 10,590 children in the United States under the age of 15 would be diagnosed with cancer in 2018. About 4 million American babies are born each year. If we assume that, since cancer is the second leading cause of death for kids under age 15 and 80% of child cancer patients survive, we can multiply 4 million babies per year times 15 years to run some numbers, that means the percent chance of your baby being born with Hirschsprung’s is actually slightly greater than being diagnosed with cancer in a given year. We already know that oxybenzone (and octinoxate, although that chemical isn’t pegged in this study) is a potent endocrine disruptor, interfering with sexual development of children and fertility in adults. Now we know that oxybenzone also causes this birth defect. 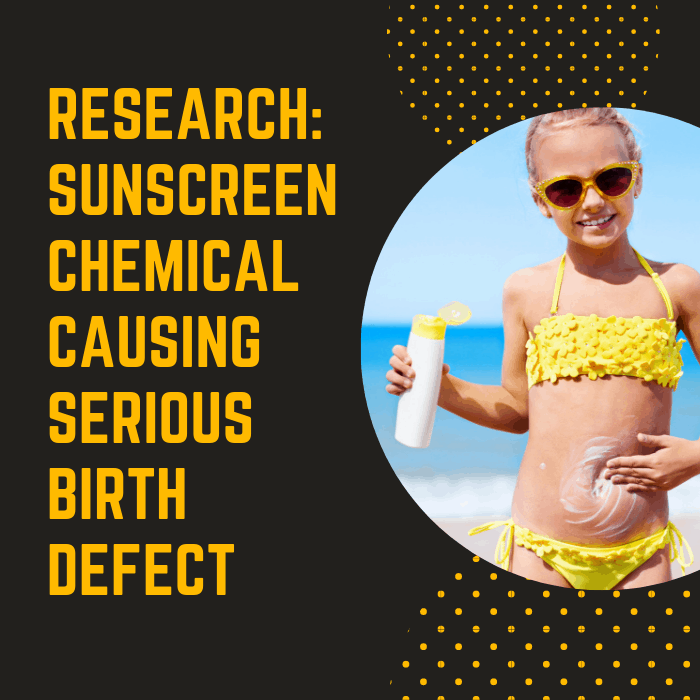 In fact, if a newly pregnant mother uses the recommended daily application of a conventional sunscreen containing 6% oxybenzone (very common concentration), her baby may have blood levels as high as 384 parts per billion, potentially toxic at the cellular level. But at least we can just avoid these ingredients while pregnant, right? NO! Because they’re so ubiquitous in the environment as they wash off everyone else’s bodies into the water supply, even bathing can cause an exposure. 🙁 Plus oxybenzone is fat-soluble and can stay in the body for weeks after exposure. A 2019 study in the Clinical Dermatology Research Journal by DiNardo and Downs questions whether sunscreens containing oxybenzone (among other active ingredients that I’ve been rallying against for years) should even be considered for use on children at all. In the meantime, children are getting their “sun-safe” application of these chemicals on a daily basis, especially as we head into summer. She calls for health practitioners to feel a grave responsibility to educate their patients, helping them understand why they need to avoid endocrine disruptors like oxybenzone. 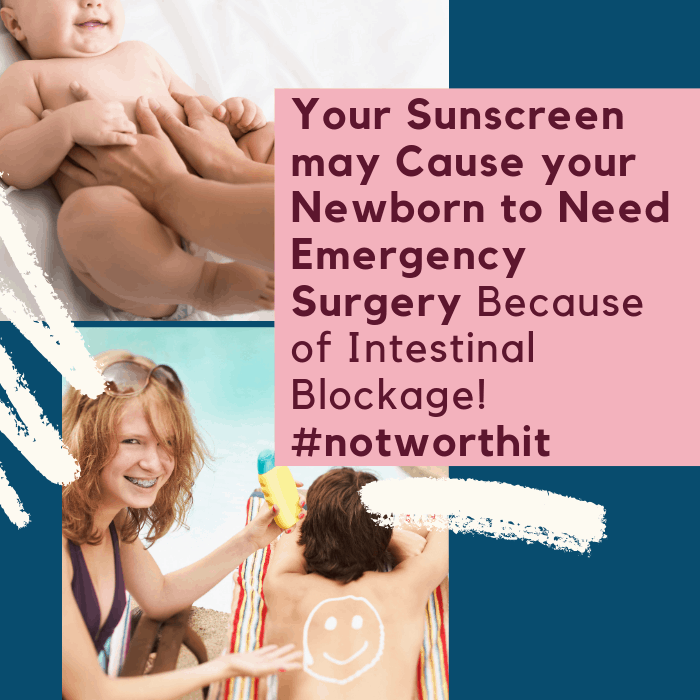 Wouldn’t it be great if OBs started sharing with new moms-to-be about how to make a simple swap from conventional sunscreen to a mineral-based option? There are many good ones to choose from (my family has tested over 100 personally, so believe me, we know!). It’s time for parents to put up a fuss about this – the industry will only listen when the consumers speak with their money, their social shares, their very loud outcry against toxic ingredients that are probably harming our babies, our children, and our possibility of future grandchildren (not to mention coral reefs, ocean life, and your own reproductive health)! Tropical locations are getting on board more and more with banning these ingredients, but we really need sunscreen brands to commit to removing oxybenzone and other endocrine disrupting chemicals for a true shift to happen. Whole Foods just announced that both oxybenzone and octinoxate are not allowed in their stores…won’t it be great if all of Amazon would follow??? 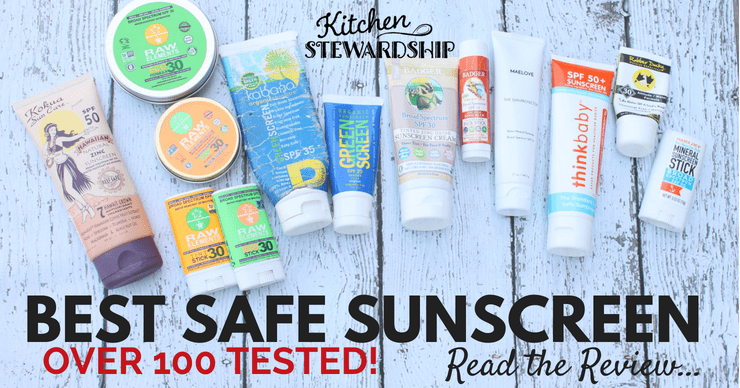 READ ingredients on other personal products, watching for oxybenzone – put them back on the shelf! If you’re frustrated that these chemicals are already in our water supply, share as often as possible so we can STOP the buildup more quickly! Read the entire research study here, galley proof, or the abstract on Science Direct, or the full published PDF at the Clinical Dermatology Research Journal. I just picked up two packages of sunscreen from Costco that do not contain the oxybenzone and the other “O” ingredient, forget what it is. I plan to share it with my family. I’m glad I read your last article about it so that it caught my eye when I saw it at the store. Any idea why it got removed? Thank you for this valuable information, I will be sharing this information with my family and friends! Hi, Katie. As a mom of a child with Hirschprung’s Disease, I’ve been affected by your article here. While I do not feel responsible for my daughter’s disease (and successful surgery at 5 days old with minor lingering effects), I fear that the way this information is presented is overly dramatic and based in fear. I spoke with my dermatologist just this morning during my early skin check and he confirmed that, while there are studies out there that purport to find links between oxybenzone and hormone disruption, the way the studies are carried out on animals and at unrealistically high dosages, the danger to humans is far less severe than presented in your article. 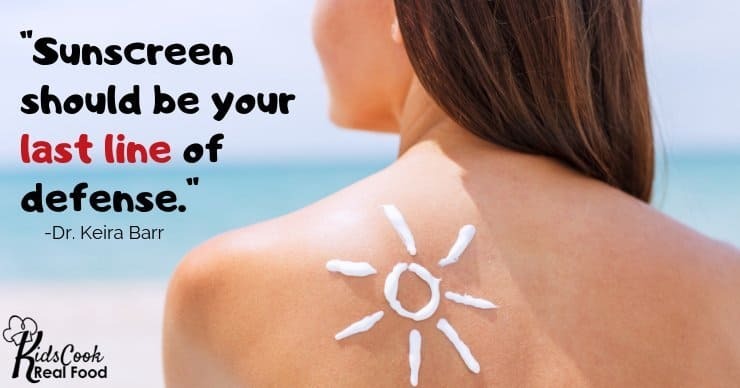 He did promote shade, UPF clothing, and zinc oxide (or similar) methods as preferable, but stated it would be more harmful to get a sunburn than to not wear an oxybenzone product from time to time. I have enjoyed your blog for years, but this article has struck a cord with me… Presenting opinions and other findings in a more positive light, with positive psychology at work, might reach your audience in the same, but more uplifting, way. Hi Jill, I’m so sorry you had such a medical crisis with your newborn; how terrifying! 🙁 I completely understand how you felt about the presentation here and hope you’ll allow me a few words to explain more. First, your dermatologist probably wasn’t familiar with this research as it literally just came out at the end of March; also, being a skin expert, he would certainly be biased toward the skin diseases and not the birth defects. It’s just the way information works because he’s immersed in skin info and sees skin disease, so like your antennae went up when you saw this post, his go up when it comes to skin. One of the studies mentioned here is specifically on pregnant women, finding a correlation between high levels of oxybenzone contamination in pregnant mothers’ urine and Hirschsprung’s. So it’s not entirely unfounded that there’s a correlation (which isn’t necessarily causation but those studies are unethical so this is all we have). Second, I would never EVER say that a mom was at *fault* for her baby’s birth defect – unfortunately we all take collective blame for that with what we put in the environment. But we can often only control our own surroundings, so I have to speak to pregnant women. On the tone, I wish I could write an encouraging article and have anyone care, but I’ve learned that if I don’t bring in the C-word (cancer) or make something sound scary, no one pays any attention, even though I dislike the strategy. 🙁 I’ll never overstate facts or stretch the truth, but sometimes I have to use tough words for anyone to care. I’m so sorry it felt as if I was placing blame on you for your baby’s birth defect though; definitely not my intent. I don’t think Hirschsprung’s is widely recognized enough as it is, so people still didn’t really get into it. Have you ever seen other advice on how to help moms avoid this one, or is the common wisdom just, “Things happen, nothing you can do?” I always want to think there’s something I can do, just my nature as a teacher and a fixer. So if it’s as easy as avoiding some chemical ingredients, I want to shout it far and wide to improve our collective environment. I hope you can see my intent, and I’m more than happy to continue the dialogue. Thanks so much for opening it up respectfully!